A lighter pasta dish with a hint of artichoke and cheese. and the reviews for it are mixed. 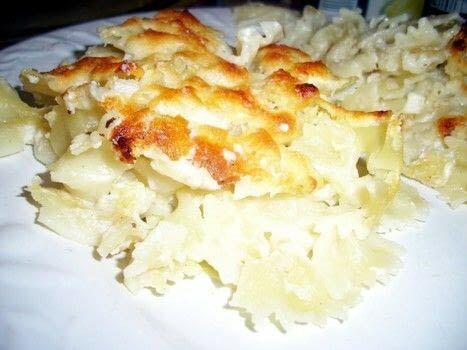 My son loved it, especially the cheese layer on the top. 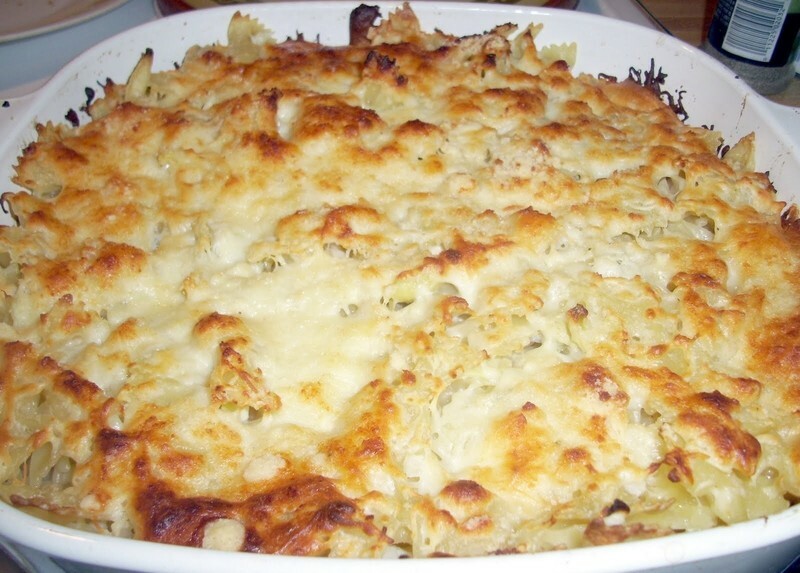 I like a more creamy, cheesy pasta dish and I would prefer it with a little garlic, but than again, I am garlic lover. I am also conditioned that if a casserole goes in the oven, it must be topped with crushed crackers, but I do admit I like the light but a bit crunchy taste that the cheese topping brings. If you are looking for a lighter pasta than the standard cream based, this is worth trying. Pre-heat the oven to 350 degrees. 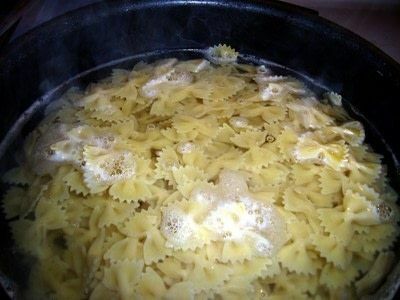 Cook the pasta according to the package - I used Meijer's brand Farfelle which required bringing water with salt to boiling then add pasta, and cook for 11 minute, but pastas seem to vary by brand and type. Once cooked to Al dente, drain pasta. I spritzed the pasta with non-cook spray and tossed, but that is optional. 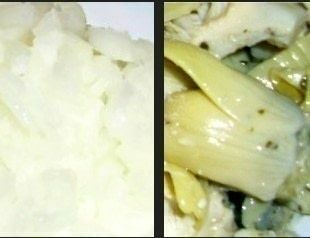 Chop onion and artichoke. The original recipe called for sauteing the onion in a little olive oil until transparent, but I used the onion raw instead. 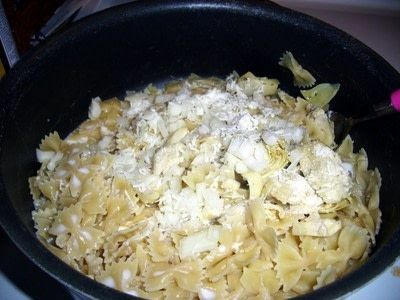 Mix the onion, artichoke and milk in with the pasta together. Add a few dashes of salt and pepper. Spray the baking dish with non-stick coating, then transfer the mixture from the pan to the baking dish. 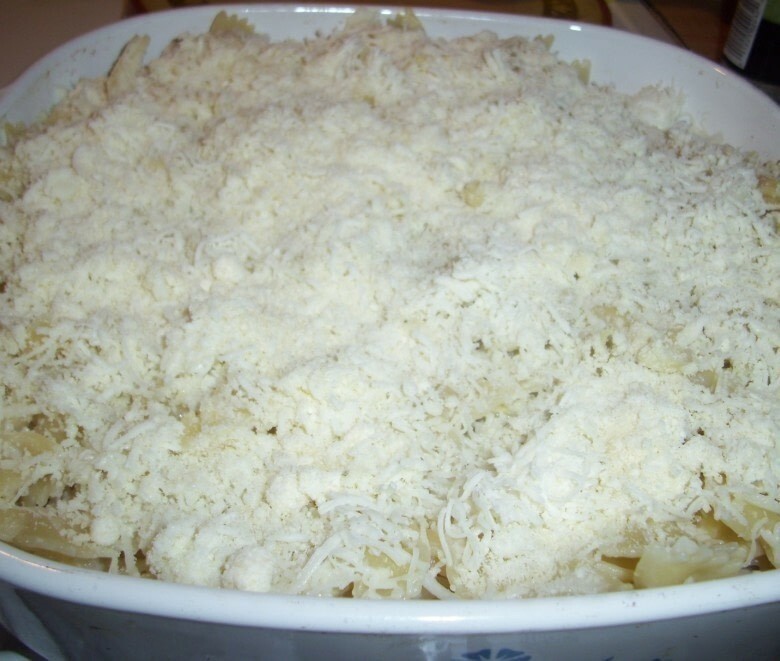 Put Mozzarella cheese and Parmesan cheese on top of the pasta and put in the oven..
Bake for approximately 30 minutes or until the cheese starts browning a little on the top. 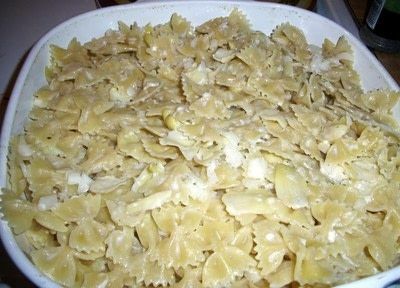 I cut into 9 large pieces as it was the main dish, but we still had plenty left over and it should freeze well if you didn't want leftover the next day.